About two years following the events of the first film, college student Peter Parker was experiencing a myriad of problems due to his crime-fighting interruptions ("disturbances") as Spider-Man: perpetually late and then fired from his Joe's Pizza delivery job, money problems, tardy as a Columbia Univ. physics student with steadily-declining grades, and life in a walk-up studio apartment where he was perpetually behind on the rent, and his Aunt May (Rosemary Harris) faced foreclosure. He had lost contact with friends, including still-bitter Harry Osborn (James Franco) who held Spider-Man responsible for his father's death - and now head of the Special Projects division of his father's company Oscorp, and long-time love Mary Jane Watson (Kirsten Dunst) - a billboard model and off-Broadway stage actress. Oscorp was funding fusion experiments being conducted by Peter's idol, Dr. Otto Octavius (Alfred Molina), who told Peter about his work to create: "a perpetual sun providing renewable power for the whole world". Peter disappointed Mary Jane by missing her 8 pm stage performance of "The Importance of Being Earnest" due to his crime-fighting Spider-Man duties - and he found he was beginning to lose his powers. During a demonstration of Dr. Octavius' fusion-energy-producing apparatus (fueled by rare tritium) with 4 mechanical tentacle-arms ("impervious to heat and magnetism") attached to a waist-harness and controlled by a spinal-computer-brain interface, the device overheated, exploded, and the apparatus became fused to his body - and his wife Rosalie (Donny Murphy) lost her life. When doctors attempted to surgically remove his arms, Octavius killed his surgeons and escaped, and was subsequently nicknamed "Doc Ock" by the Daily Bugle's chief editor Jameson (J.K. Simmons), who continued to regard Spider-Man as a menacing criminal. During a bank robbery sequence, mad scientist Doctor Octopus, believing that he could have "the power of the sun in the palm of my hand" if only he had money, seized bank customer Aunt May as hostage - who was saved from certain death on the side of the building by Spider-Man. At a planetarium party for Jameson's astronaut hero son Capt. John Jameson (Daniel Gillies), the new fiancee of Mary Jane, Peter served as the Bugle's photographer, where he was accused by an inebriated Harry of stealing his girlfriend, his father's love, and for befriending Spider-Man. Devastated by his recent personal setbacks, Peter lost his web-producing and wall-climbing powers and decided to make a personal choice (while having a vision of his final conversation with Uncle Ben (Cliff Robertson)): "I want a life of my own...I'm Spider-Man no more" - he discarded his costume in an alleyway's dumpster and attempted to live an ordinary life as a student (crime increasing by 75% as a result), but it appeared too late for him to rekindle his relationship with M.J. He confessed to Aunt May how he was responsible for Uncle Ben's death. Harry made a deal with Doc Ock - kill Spider-Man in exchange for the rare fuel tritium he needed for his rebuilt reactor. Peter met Mary Jane for coffee when she told him that she was reconsidering their relationship, but he stunned her when he said he couldn't return her love. Suddenly, Doctor Octavius ambushed them and abducted Mary Jane to force Peter to reveal the whereabouts of Spider-Man. Summoning his powers (and stealing back his costume), Peter reverted to Spider-Man (Headlines read: "He's Back") and battled Doc Ock atop the Westside bell Tower and then on the roof (and side) of a speeding, runaway subway train that he saved from plunging over the end of its track. "Spider-Man will always have enemies. I can't let you take that risk. I will always be Spider-Man. You and I can never be." Meanwhile, Harry had a vision of his father in a mirror, demanding that he kill Peter Parker/Spider-Man ("Make him pay...Avenge me!") with his dagger. Behind the shattered mirror Harry found a cache of Green Goblin weapons and the glider. Mary Jane left her fiancee at the altar and located Peter in his apartment where she told him, in a stunning confession, that she couldn't survive without him. Their kiss was interrupted by police sirens as Spider-Man went into action again, with her blessing: "Go get them, tiger." With most of the same characters from the original film. Nominated for three Academy Awards (with one win): Best Visual Effects (win), Best Sound Editing, Best Sound Mixing. With a production budget of $200 million, and box-office gross receipts of $373 million (domestic) and almost $784 million (worldwide). At the present time, it is the sixth highest-grossing (domestic) superhero film of all time, and the second highest-grossing (domestic) film in the franchise of Spider-Man films. 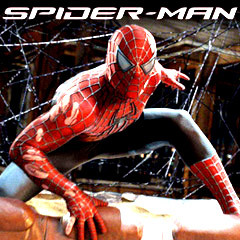 Set-pieces: Doctor Octopus' attack on the bank and seizure of Aunt May, Peter's saving of a child from a burning building, the combat between Spider-Man and Doc Ock on the Westside bell-tower and on a runaway, speeding overhead subway train, and the final battle between the two at an abandoned warehouse.